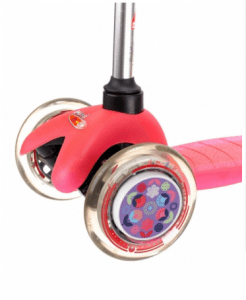 These funky Micro Scooter Wheel Whizzer’s fit any Original Mini Micro, Maxi Micro, Mini Micro Deluxe or Maxi Micro Deluxe Scooter. They click on easily and securely to Mini or Maxi Micro wheels to create fabulous patterns as the wheels turn. Wheel whizzers make an excellent gift for small scooter riders. The Wheel Whizzers fit on Mini Micro or Maxi Micro models. The Micro Scooter accessories are a brilliant way to get the most out of your scooter. Micro have released a large range of fun and exciting accessories with vibrant colours that you can personalise your scooter in your own unique style.